Starring: Zachary Levi, Mark Strong, Jack Dylan Grazer, Asher Angel, Djimon Hounsou, Marta Milans, Grace Fulton, Cooper Andrews. For far too long now, DC has been overshadowed by the might of the Marvel Cinematic Universe. The problem was that ever since Christopher Nolan took on the Dark Knight, DC went down the road of making their superhero creations too serious, or in the case of some of their films, pretentious. What they all seemed to lack was a sense of humour. Now comes Shazam! and while it’s not the most original of movies, is undoubtedly DC’s best. Billy Batson, a teenager who was abandoned by his mother when he was young, has been moved from one foster home to another due to his hunt for his real parent. Moving in with the Vasquez, Billy has to cope with five other foster children, including Freddy, a superhero fanatic, When protecting him from bullies, Billy escapes and soon finds himself transported into a strange world where a wizard hands Billy the power of Shazam! A superhero, to bring back the escaped Seven Sins who have been stolen by Dr Sivana. Yet having a fully grown adult exterior with powers is more than Billy can cope with. Borrowing heavily from Tom Hanks’s 1988 film, Big (including a nod involving a floor piano), this puts an interesting twist to the whole great powers comes great responsibilities. This is the story of a boy who not only has body swapped with an adult and all the difficulties that bring but he also has a host of powers that Billy cannot control. The film takes a little time setting up the premise. It starts in the ’70s with a boy, bullied by his father and elder brother, who finds himself in the cave, asking if he was pure of heart. Sadly, it seems he isn’t, and years later the boy grows up to be Dr Sivana, the villain of the piece, who steals an orb that controls the Seven Deadly Sins. It’s more critical for the wizard to find someone. Billy fits the bill. Yet the teenager doesn’t have a clue. This is where the film kicks into action. What does a teenager do if he has the body of a man? He goes to buy beer (only to discover it’s not all it cracks up to be). He gets Freddy to video what powers he has, which are instantly placed on YouTube. All the time is trying to hide his identity from his new family as Freddie announces, the bad guy will go to the ones closest to the hero first. Which happens. 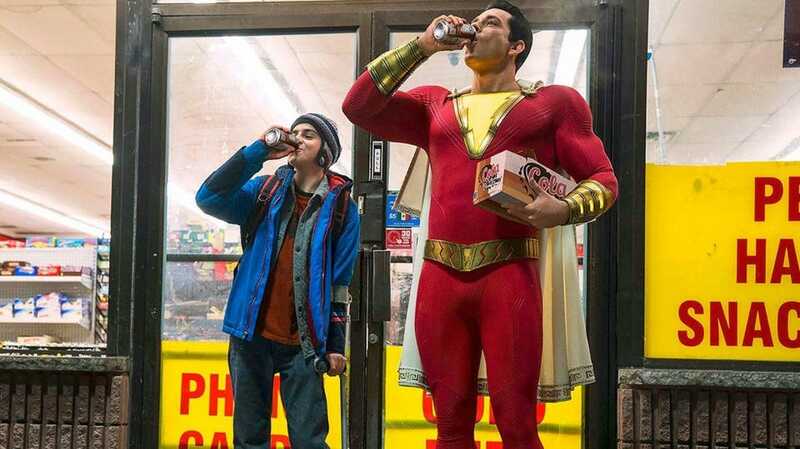 After the slow start, the film zips along with tremendous pace and is full of knowing winks to the audience with plenty of in-jokes about DC and the other superheroes from that world. There’s also plenty of gags about a child not knowing about his powers and how he can use them for his own personal gain until the finale which is the showdown between Shazam and Sivana. It also starts to head down the road of sentimentality. Luckily it stops itself from becoming too mawkish. The performances are fun. 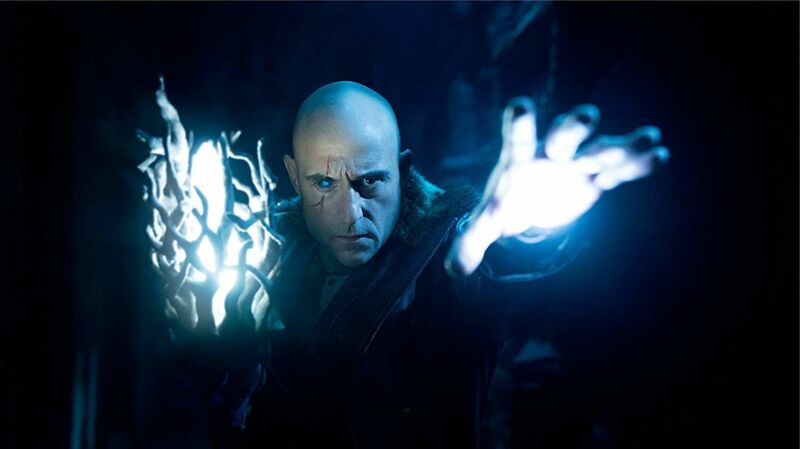 As Dr Sivana, Mark Strong seems to be enjoying himself far too much, hamming it up as much as he possibly can. Even a hammy Strong is an engaging Strong. 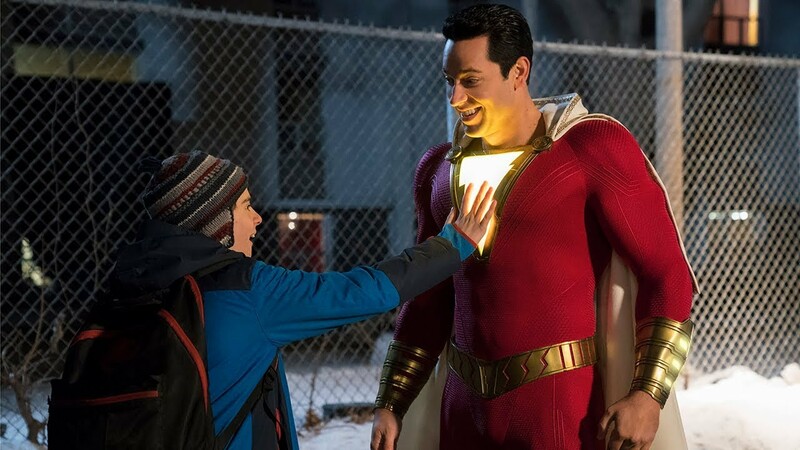 As Shazam!, Zachary Levi is a blast, mixing the innocence of a teenager with the excitement of a child, shifting to maturity when needed. It’s a joy to watch and will undoubtedly put Levi’s name up there with other big-screen heroes. Shazam! is terrific. A fun slice of popcorn entertainment that never takes itself seriously and manages to prove that Marvel doesn’t necessarily have a monopoly over comedy superhero movies. DC should take heed and forget about being dark and moody. This is what audiences really want from a superhero movie.